NOVA celebrated the diversity of it students during International Days week. During a week of activities, parents came into the classrooms and shared with students a story, craft, food or game from their home country. 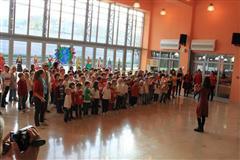 On Friday, November 2, from 2:00 – 3:00 there was an Elementary International Days Performance. Students sang songs from around the world and performed folk dances, culminating in a Parade of Nations where children wore ethnic costumes and clothing that illustrated where they are from and where they have traveled. It was a joyous celebration highlighting all our children from around the world.